Welcome to the Resource for Retirement! One of the best retirement websites.....updated each week. We've designed this site for people of all ages who need to map out a retirement plan and expand their knowledge. We'll provide a clear understanding, tips and education on 401k's, 403b plans, IRA accounts, SEP's and employer pension plans. Our annuity section will explain the basics of these investments. And, we've provided some of the most helpful retirement calculators. We've also updated the IRA, Roth IRA, and 401k employer contribution limits for 2019. Stay on top of all the retirement and personal finance news. Visit our retirement blog each week. Check Out The New Search Feature! It will be easy to find all the articles on our site. As you approach retirement or change jobs we'll help you understand Rollovers and all the steps necessary to set up IRA accounts. We'll help rollover your 401k, 403b or other retirement plan. You'll find valuable insight to make the rollover process simple. 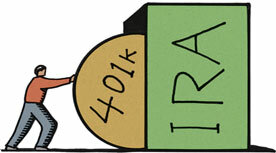 401k rollover information is right here! Visit the 401k Rollover Center to learn more. We'll discuss Social Security, Medicare, retirement income, health care and insurance and all the impact Congress has on these topics. Each of these "pieces" will shape your retirement. Visit our Retirement Articles section each week to see the collected articles. You'll see a updated journal (okay call it a "blog") of articles we're reading. RetirementThink..The online retirement magazine. Visit us each week! We've assembled helpful information for retirement investors. It's a great educational resource and updated each week. However, every investor situation is unique and possibly complex. Please consult financial planners and tax advisors for additional help. This information does not represent a recommendation to buy or sell securities.